Phelps Tire and Rubber Company has manufactured high performance automotive tires for over 50 years. They claim the mileage life of their tires is Normally distributed, and will last for an average of 35,000 mi with a standard deviation of 3,000 mi. 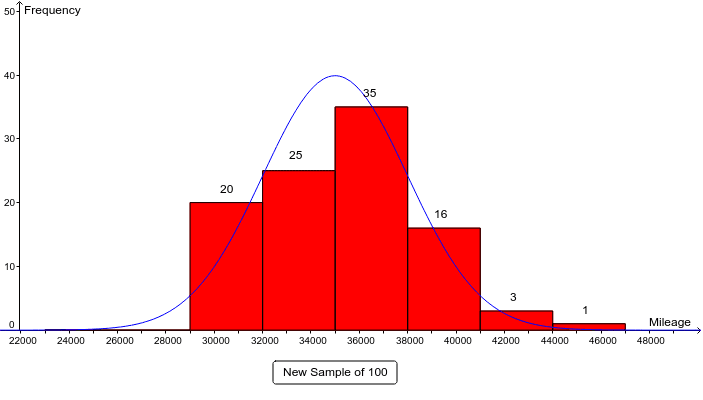 The histogram below shows a random sample of 100 tires. (a) Would you be surprised if a set of Phelps’s tires needed to be replaced after 38,000 mi? (b) Would you be surprised if a set of Phelps’s tires needed to be replaced after 29,000 mi? (c) Approximately what percent of their tires will last for more than 40,000 mi? (d) Approximately how long will the most durable 10% of their tires last? (e) Phelps Tire and Rubber would like to offer a replacement guarantee on their tires if their tires need to be replaced before a certain mileage. However, they want to replace fewer than 2% of the tires customers buy. What tire mile- age should Phelps Tire and Rubber guarantee? (f) Phelps Tire and Rubber sold just over 900,000 of their high performance tires last year. How many tires would you expect to be replaced eventually?